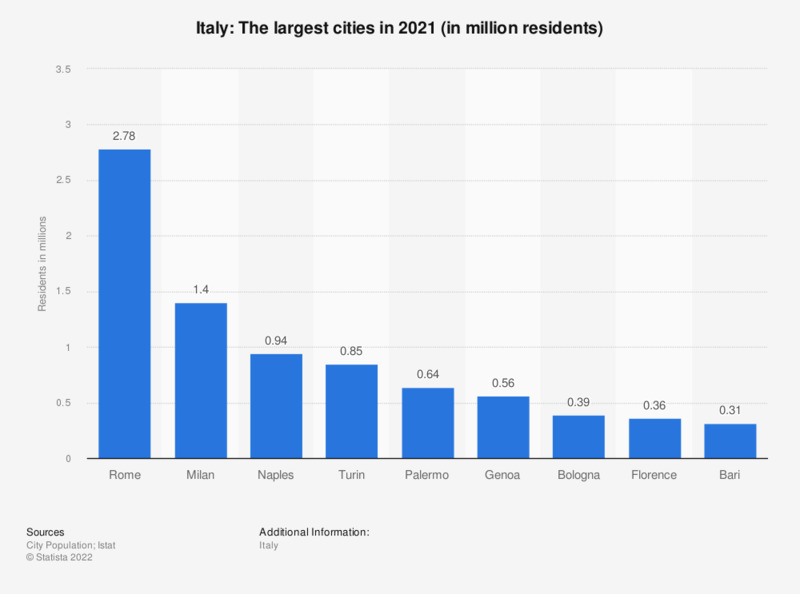 This statistic shows the ten largest cities in Italy in 2015. In 2015, around 2.86 million people lived in Rome, making it the largest city in Italy. Italy has high population figures and a high population density in comparison to other European countries. A vast majority of Italians lives in urban areas and in the metropolises (as can be seen in this statistic), while other areas, such as the island Sardinia, are rather sparsely inhabited. After an increase a few years ago, Italy’s fertility rate, i.e. the average amount of children born to a woman of childbearing age, is now on a slow decline; however, it is still high enough to offset any significant effect the decrease might have on the country’s number of inhabitants. The median age of Italy’s population has been increasing rapidly over the past 50 years – which mirrors a lower mortality rate – and Italy is now among the countries with the highest life expectancy worldwide, only surpassed by two Asian countries, namely Japan and Hong Kong. Currently, the average life expectancy at birth in Italy is at about 83 years. Most of Italy’s population is of Roman Catholic faith. The country actually boasts one of the largest numbers of Catholics worldwide; other such countries include Brazil, Mexico and the United States. The central government of the Roman Catholic Church, the Holy See, is located in Vatican City in the heart of Italy’s capital and ruled by the Bishop of Rome, the Pope. Officially, Vatican City does not belong to Italy, but is a sovereign state with its own legislation and jurisdiction. It has about 600 inhabitants, who are almost exclusively members of the clergy or government officials. According to the source, data relate to urban areas only.